The album kicks off with the closest thing Half Smiles has to a single, Everybody Thinks I'm A Raincloud (When I'm Not Looking). This is the last song GBV played live on television (on Conan), and it is also the heaviest track on this overall, mellower album. It is a very optimistic sounding tune which sets the stage for a great send off. The oddball Sleep Over Jack follows, and it is one of the more interesting tracks in the later GBV period. Dark, creepy, and strangely addicting, this is a Circus Devils song too good to be a Circus Devils song (with all respect to that wonderful band) and may be the true gem on Half Smiles. Its all about melody with Girls of Wild Strawberries, an acoustic number with some beautiful lead guitar. This is probably a good time to note that Pollard is at the top of his game lyrically on Half Smiles; "In tribes I played/Survived and prayed to be free/And send my letters out/Delivered sermons to the sea/For the girls of wild strawberries". Gonna Never Have to Die is proof that this album was meant to be contained somewhat. This track could have been loud, fast, and a rocked out anthem, however, it is kept low-key with an awesome acoustic outro solo. It kind of reminds me of Pearl Jam in the way that Pearl Jam has all these great rockers, but they are tempered a bit and fleshed out, and more rewarding in the end. Window Of My World is the closest thing GBV has to a song found in some movie musical. The deep reverb chorus sounds as though Pollard's singing in some dance hall, and I can't help but to picture the cheesy video shown at the beginning of GBV's final show in Chicago. Nonetheless, its another great pop ballad from Guided By Voices. If I heard it out of context, I would have guessed that Closets of Henry was straight from Do the Collapse. Though lacking the obvious polish of that album, the big stadium chorus ("Wings refer to the wedding cake/The glasses fall and hearts will break/The primal scream is hard to take, you know") almost makes you wonder if Pollard was making another attempt at mainstream success. The best moment of Half Smiles belongs to the otherwise unnoticeable Tour Guide at the Winston Churchill Memorial. I'm referring to the first two times Pollard sings "Be on top of me now". Once again proof that Pollard has the ability to make you love a song because 2% of it is beautiful. Maybe the second greatest moment belongs to "Nothing could be finer, yeah/In Asia Minor, yeah/The devil in the china, yeah" from Asia Minor, a track with rolling verses and cutesy piano. Tying for longest song on the album (at four minutes) are the next two tracks, Sons of Apollo and Sing For Your Meat. Both of these tracks are buried on an album with more exciting songs...they're okay. Asphyxiated Circle picks things up again with the wonderful line "Expand, explode, wrinkle up or blow away". Its a short and sweet straight-forward pop nugget. I never really liked this song for a while, but it has definitely grown on me on repeated listens. 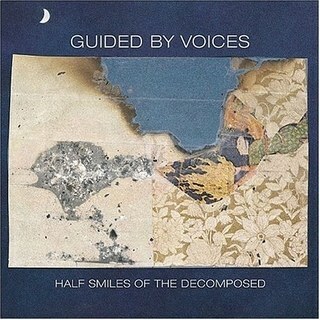 In fact, this entire album took a little longer in general to grow on me compared to other GBV albums. A Second Spurt of Growth is a quiet lullaby which features Pollard's best vocals on the album, and (S)mothering and Coaching is a bit all over. It starts out quiet, jarringly switching to haunting and angry, before settling into that classic Pollard pop tune. Now lets talk about the finale, Huffman Prairie Flying Field, the album's arguably best track. Anyone who listens to GBV has noticed a tendency to have aircraft themed songs and albums...White Striped Jets, Everywhere With Helicopter, You're Not An Airplane, Man Called Aerodynamics, Static Airplane Jive, Isolation Drills, We've Got Airplanes, & Not Behind the Fighter Jet to name a few. It just seems so fitting to have this theme (even if it is mostly in the title only) as the concluding chapter in the GBV story. Along with Raincloud, these two tracks form a sort of bookends with their happy and optimistic sounding rock. Raincloud lets you know that GBV is sending you off with a gooder, and Huffman Prairie Flying Field leaves it on a high note. Half Smiles of the Decomposed may not be the best album, but it is a good album, by the greatest band. Although it is quite straight-forward by Pollard's standards, Girls Of Wild Strawberries would be in my top 10 GBV tracks. Tour Guide at Winston Churchill Memorial is one of GBV's best ever "mood" pieces (along with Privately and Dirty Water), featuring some excellently understated guitar work. And you reduce it to two lines! Well, one really. LOL! What about that mesmerizing guitar break at about 1:50 in...it does for me what the violin break in Don't Stop Now does for my wife...it sets me at ease...and that is worth something indeed. Bravo Bob Pollard! My god! Your wife appreciates the violin break in Don't Stop Now?! I want her to be my wife! Sleepover Jack is insane! The weird voice in the middle and the outro remind me of Yellow Submarine for some reason. Took a while to grow on me too, but damn it's good (Mr Jam)! Huffman Prairie Flying Field is a great track to end an album on. I personally don't think the album was even close to their best, even though it has some great tracks. Isolation Drills or Under the Bushes... are both solid albums first track to last. This album was terrible. I listened to it once and was totally disappointed. Universal Truths should have been the last album because that one was solid. I loved this on first listen (except Jack and Leon) but would now leave tracks 9-13 off my list. That first side still takes some beating if (mostly) mid-paced, snippet-free, hi-fi rock'n'pop is your cup of meat.